The Blackmagic Cinema Camera was by far the most popular attraction at NAB 2012, and I had a chance to sit down with Blackmagic Design’s president, Dan May, to discuss the camera and more. Listen to the doddleTALKS Tech podcast with Dan here. 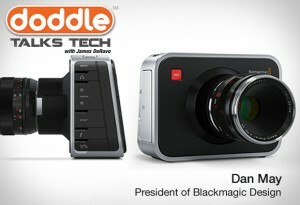 Here are the specs for the Blackmagic Cinema Camera, and our video look at the camera.